Hello! So do you all remember my Fashion Over Fifty Post HERE where I talked a little bit about the area I live in and how some nights driving home from work can be a real obstacle course trying to avoid all the wildlife running into the road? Well, guess what was standing on the side of the road as I was driving to work yesterday? Yes folks, that's a moose. He was eating horseradish leaves in a horseradish field right next to a horseradish factory on a busy freeway on the outskirts of city with a population of over 65,000 people. 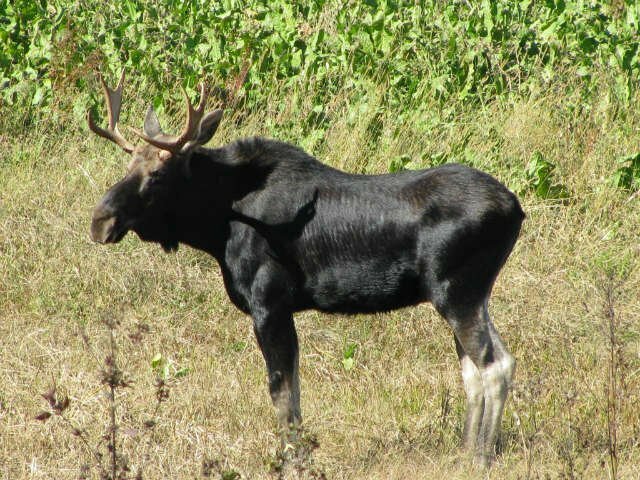 He created quite the traffic problems, since we really don't see moose in our area, like, almost NEVER. And apparently he didn't mind all the attention he was getting. He just enjoyed eating his horseradish leaves. They must have been pretty tasty for him to just continue to ignore all the attention he was getting and just stand there eat for over an hour. Of course, this created quite the excitement in our community as everyone dropped everything and drove to the horseradish factory to see the moose. 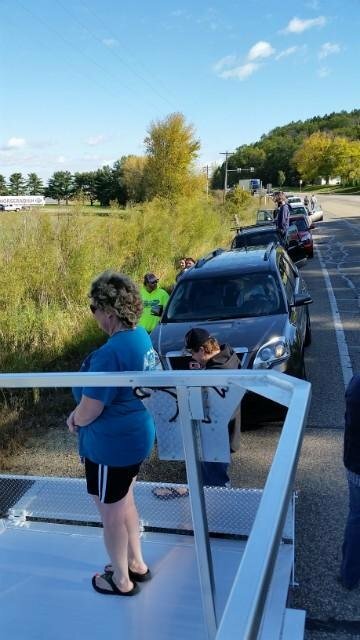 The police had to come to direct traffic to prevent accidents. The local t.v. station came and did a story on it. You can read all about our horseradish loving moose HERE and see a short video. Folks I have driven through the mountains of North Carolina, New Hampshire, and Vermont and I have seen plenty of moose warning signs, but I have never seen an actual moose. I have been to northern Minnesota, and Canada, and again, I saw lots of moose warning signs, but I never saw a moose. So where do I find a moose? In my own hometown, in a horseradish field, along a busy freeway, while driving to work one day. 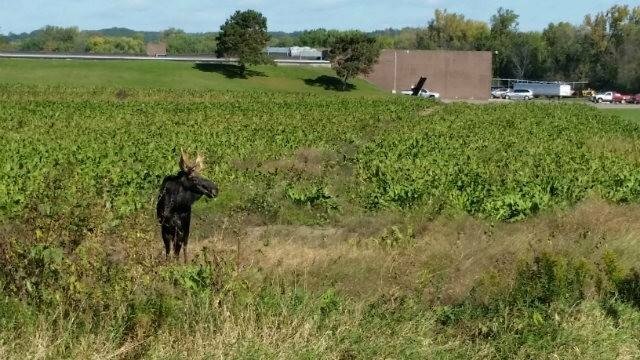 The DNR said the moose is migrating through the area. I don't know where he came from or where he is going, but I'm glad he chose our little city to travel through. And I wouldn't mind it at all if he chose to stick around. For a short while, he took away all our troubles and worries, and allowed us to just enjoy the little miracles of life. Thank you Mr. moose. LOL!! Too funny!! We worry about cows sometimes, but deer can be a problem on the highways. :) Not moose though!! OUCH! !